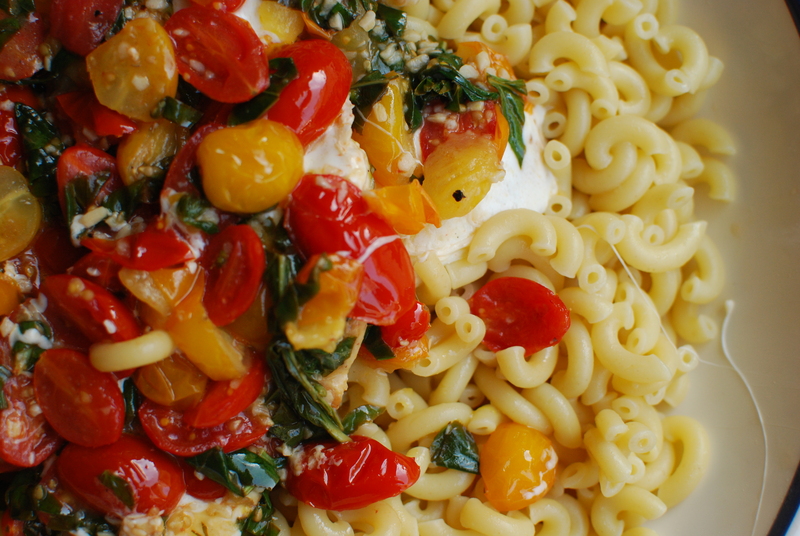 If you like caprese salad, you’ll love this carprese chicken pasta. Everyone loved this dish! I promise there is chicken in there. It’s just under all those delicious tomatoes, basil, and cheese. ***Note: I’ve also made this dish without the chicken and instead of melting the cheese I just cut the cheese up or use the mozzarella pearls and serve this caprese pasta salad cold. It’s beyond delicious and great for potlucks and picnics. So flavorful. In a large sauté pan over medium-high heat, warm 1 TBSP olive oil. Add chicken, cover pan, and cook for about 10 minutes. Flip chicken breasts and continue cooking until the chicken is cooked thoroughly (or has reached an internal temp of 165°F). While chicken is cooking, in a medium sauté pan over medium-high heat, warm remaining 1 TBSP olive oil. Add garlic and cook for about 1 minute, or until fragrant. Add tomatoes and continue sautéing until tomatoes skin starts to soften/wrinkle, about 5 minutes. Remove from heat and stir in basil. Set aside. When pasta is done, transfer to large serving bowl, and add zest, lemon juice and butter, and mix to combine. Lastly, drizzle chicken and/or pasta with a splash of balsamic vinegar and serve chicken immediately over pasta.